“The souls of our dear departed ones, all six million of them, are crying out to the world in a single word: ZACHOR. Thank you so much Ben Lesser for being here. It’s a real pleasure to interview you. Please tell us more about you (where do you live now, if you have got a family…)? My name is Ben Lesser and I am a Holocaust survivor. I was born Krakow in 1928 and lived through the Holocaust. My parents, brothers, sister, and most of the rest of my family was murdered by the Nazis and only my sister and I survived. I moved to America in 1947 where I met my soul mate and best friend, my wife of 65 years Jean. Today, I have been blessed with two beautiful daughters, four amazing grandchildren, and one amazing, remarkable, sweet great grandson. Jean and I retired to Las Vegas, or should I say we thought we might retire. The truth is that I have never worked this hard since I was in the camps. Because of my Holocaust experiences, I created the ZACHOR Holocaust Remembrance Foundation, a non-profit organization that supports Holocaust education, remembrance of all and for all peace-loving people. Can you tell us more about your life during the World War II? When I was 11 years old, the Nazis invaded Poland and my life changed forever. For the next few years my family fled from Krakow to Niepolomice to Bochnia to Hungary. In May of 1944, my family was split apart and forced into cattle cars for deportation to Auschwitz-Birkenau. In 1945, my cousin Isaac and I survived the death march to Buchenwald and then the death train to Dachau. Later that year, Isaac and I were liberated from Dachau by the Americans but my Isaac died in my arms shortly after from malnutrition. I was 17 years old. 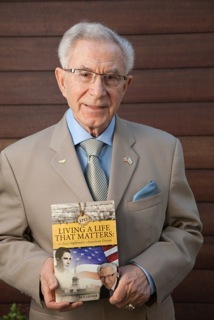 I documented the experiences I had during and after the war in my book Living a Life that Matters: From Nazi Nightmare to American Dream. The book is an extension of my life and I hope that it will serve as an inspiration that anything is possible when someone chooses to focus on the positive in life. You’re a Holocaust Survivor. What camps were you in? I was in Auschwitz-Birkenau, Durnhau, Buchenwald, and Dauchau. Was any member of your family there with you? After my family was split apart in 1944, I never saw my parents again. I was sent to Auschwitz with my brother Tuli and sister Goldie, my uncle, and cousin Isaac. Only my cousin Isaac survived the war with me though he died shortly after. After the war, I learned that my sister Lola also survived and we were reunited. She lives today in with her children and grandchildren in New York. What were the camps conditions like? The camps were terrible. Starvation was constant. We were eaten up by bed bugs. Did any of the camps guards show any compassion? Was it possible to hope during the Holocaust? Hope was all that we had. Were there any possibilities of escaping? Did someone try? One day in the labor camp Durnhau, three inmates escaped while we were working in a quarry. As a deterrent to potential future escapees, we remaining inmates were punished harshly by the guards. After the long day of work, we were made to lineup of rows of five and were counted and recounted to instead of letting us go to get our rations and go to sleep. Filthy, exhausted, and starving, we could barely stand up. The Commandant came down and ordered his underlings to pull out every tenth person in line to receive 25 lashes. As they were counting and pulling out people from line, I could see that my uncle, who was in front of me, would be a number 10. Knowing that he would never withstand a beating like this at his age, I decided to switch places with him and become number 10. The Commandant ordered two inmates to bring down bundles of one-by-one inch hardwood stakes, that were about two feet long, with razor sharp edges – and guaranteed to inflict maximum pain. The Commandant then came down with a drink in one hand and his female companion on his arm and commanded for each tenth man to be beaten while standing very close to a sawhorse, up on their tiptoes, with their knees bent into the opening of the sawhorse and body arched up over the sawhorse without touching it. We had to count out loud while we were beaten. If we miscounted, we had to start over from one again. If our heels touched the ground or our bodies touched the wood of the sawhorse, we had to start over from one again. Three men were beaten mercilessly before me. One who seemed like an older man, but was probably in his early thirties, went up, got into position, and within seconds of the first blow, we could see a line of blood seeping through his trousers. As he shrieked in agony and terror, he lost his count, and they started all over again, yelling at him, “Louder! We can’t hear you!” Over and over again . . . until finally, he collapsed. His collapse seemed to be a personal insult to the Commandant, who quickly stalke over to him, kicked him in the face with those brutal, shining Nazi boots, and screamed, “Du verfluchte Jude Schweine (You accursed Jew pig).“The Commandant then pulled out his revolver and shot the crumbled, helpless man in the temple. So now it was my turn. Three brutally murdered bodies lay on the ground in front of me, their blood soaking in to the dust. I was 15 years old, but despite all I’d been through, I was still determined to live. I must have developed some kind of self-hypnosis in order to let my mind leave my body for a while, because without a thought I walked over to the sawhorse and “assumed the position.” I arched my body over the top, shifted my weight to my toes so I could bend my knees underneath, and made sure that no part of my body touched the flesh and blood splattered sawhorse. A fresh new inmate, one that was selected to enforce the Nazi rules, pulled the top of my trousers as tight as the top of a drum, and then his partner began hitting me with all his power. It almost seemed as if I was some carnival attraction and that these “men” wanted to make a special impression on the crowd. With each hit, even though I could feel my flesh being torn from my body, I stayed focused on my task, counting as loud and strong as I could. I almost barked the last three numbers: 23 . . . 24 . . . 25. . .
About 30 minutes later, the three escapees were caught, brought back to camp and promptly hung. If only they had been caught 30 minutes earlier. Did you meet someone in the camp that helped you or gave you courage to keep going? Correct me if I’m wrong: you have been deported to Dachau three days before the liberation. How did you feel when the Americans liberated the camp? We had mixed feelings at the time of liberation. We were happy that the killing would stop but we were also forced to fend for ourselves. We had no home to go or any idea how we would survive. There was no one for us to hug. On the day of liberation, my cousin Isaac and I could barely stand. We hung on to each other, too numb to move and too stunned to even think. We watched as two young, clean, and healthy American soldiers approached us. We didn’t even know what to think or feel. They tried to mask their horror at the sight of us with friendly smiles. They stretched out their hands and gave us a can of Spam. Of course these soldiers meant well in giving us this food, but the after-effects of eating it were ghastly. And deadly. We were so malnourished, that even though we knew better, we made a big mistake: we ate some of it. Unfortunately, as a result, most of us came down with severe, excruciatingly painful dysentery. And although we were both just barely living, Isaac was in even worse shape than I. 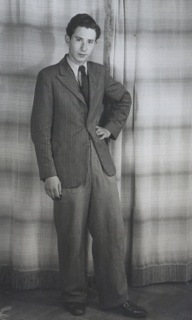 So in that long-awaited night of the liberation, after surviving so much horror, my frail cousin Isaac, who was already on the brink of death, soon became violently ill.
As his poor body heaved in agony, I held him close and spoke softly to him, telling him to hang on because we were finally free—whatever that might mean. It was over. We would have lives again. We would be reunited with our family soon. We would celebrate holidays and eat, laugh and dance. I just kept talking to him, as if my voice could keep him alive. Saying anything that came into my head. I forced my own deteriorating voice to speak stronger as I felt Isaac grow weaker and weaker. Almost as if I could command him to live. It seemed as if every loss, every torture, every humiliation that we’d suffered during the previous six years would have some meaning if only I could keep him alive. I rocked him softly in my arms all night. Even after he had died. I wouldn’t let him go. Just kept on talking to him as tears streamed down my face. In the morning, when they took his body away from me, I tried desperately to hang on to him, to go with him. But to my shame, I lost consciousness and collapsed. Somehow, unlike my cousin Isaac, I didn’t die. Why not? Through the following years, I’ve often wondered if maybe he’d been trying to watch out for me in some way. Maybe he had only felt free to die once he knew that I would be free to live. Then he said something to me that I’ll never forget, “Benek, remember to be proud of your religion. From the way your people have suffered, you’ve paid such a high price for being Jewish. Don’t ever abandon your noble religion.” Even if it had been a hallucination, hearing these words from a Catholic priest who was saving my life, made such an impression on me that it forever changed how I looked at Gentiles. And Poles. I realized that every religious and ethnic group has righteous people. That despite our differences, we share a common humanity. And that it is better for all of us to honor our shared humanity rather than to despise our differences. When we reached the medical tent, the attendants gently and respectfully placed me on a cot, covered me with a real sheet and blanket, and gave me nutrients through an I.V. (intravenous) feeding tube. After being beaten and starved, this was a reality that I couldn’t comprehend. Then I passed out. All I know is that when I regained consciousness, I was in a comfortable hospital bed in a beautiful Bavarian monastery called St. Ottilien. The monks had dedicated one wing for the purpose of medical care and rehabilitation for Holocaust survivors. I stayed at St. Ottilien for several months and focused on regained my strength. One afternoon, I overheard a group of other young Jews singing Hebrew songs about the promised land and wearing crisp white and blue uniforms. I asked the leader who they were and he explained that they were all orphans whose families had been murdered by the Nazis. It was inspiring to learn that these orphans, who had suffered so much, were already part of a very important new undertaking. They were Chalutzim, or pioneers, who were dedicated to establishing a Jewish homeland in Palestine. I enthusiastically offered to join the group, and was honored and grateful to be accepted. I was more than ready to become part of a movement that would build a Jewish homeland, thereby ensuring the safety of our people. Happily, a few days later, I was considered well enough to be discharged from St. Ottilien. While I was with the Chalutzim, I studied Hebrew and how to live the cooperative life of a Chalutzimkibbutznik. This community was based on the ideals and practices of Zionism, emphasizing mental and physical fitness as well as maintaining constant vigilance and unity. We were also shown how to fight so we could defend ourselves. It was clear that we were being trained mentally, emotionally and physically for combat. Never again would we be passive victims. Since our group had no money, and only the most primitive equipment, however, we had to use sticks instead of rifles while marching. We were able to learn how to load and use the one and only gun the Kibbutz possessed: a German Luger. I lived at Ma’apilim for almost four months. Our days were very regimented, much like a military boot-camp. And near the end of 1945, I was honored to be chosen to participate in the first Aliyah Bet. * This extremely dangerous, illegal mission, code named Ha’apala, enabled Jewish refugees to immigrate by ship to Palestine. We would be aboard the very first ship carrying Holocaust orphans to arrive there. We now had false papers and identities, and were excitedly preparing to join hundreds of other Chalutzim from all over Europe. There would be enough of us to fill an entire ship! We were to meet at an as yet undisclosed location near Frankfurt, and then journey to a port on the Mediterranean Sea. From there we would be on our way to Arzeinu, our Promised Land. We were never told anything in advance because any information that was leaked out could sabotage the entire plan, and possibly cost lives because the British would arrest any Jewish people trying to reach Palestine. A few days before departing for Palestine, my friend Avrum and I decided to go visit a sick friend Rachel who had fallen ill and was taken back to St. Ottilien. During our visit with Rachel, Avrum and I sat on her bed, in a women’s ward of the hospital. We talked for almost two hours, letting her know that we understood that she had no choice; and that we wanted her to get healthy so she could join us later. All the while, in the bed next to Rachel, was a very pregnant lady, who was totally immobilized because her leg was in a cast and elevated by a traction-sling. At that moment, however, since the only thing that mattered to me was that we were saying a sad farewell to Rachel, I didn’t pay any attention to this woman. And Rachel, who just happened to have a photo of the 10 of us, showed it to her. When the lady took a look at the photograph, she almost passed out. She screamed, “Oy! This is my brother Baynish!” She’d had no idea that I’d survived. And since she’d only seen my hair and my profile as I sat on Rachel’s bed, of course she hadn’t recognized me—especially since in the last two years, I had matured, grown taller and my voice had changed. I bore little if any resemblance to the young brother she remembered. We’d never thought we’d see each other again. And here I had been in the same room with her—only a couple of feet apart—for two hours! It appeared as if another miracle was happening. Even though our group was involved in a highly secret underground mission, Rachel finally understood that she must give Lola some information about my location. Lola was pregnant and had a broken ankle otherwise she would have come after me herself. Instead, she sent another cousin to come find me to bring me back to be reunited. He found me and though the ultimate decision was agonizing, I choose to leave the Chalutzim and the opportunity to be a part of a historic mission to help create the state of Israel and join my sister, the one surviving member of my family. Though it was difficult, it was my destiny to be reunited with Lola and my family. Eventually, Lola and I rebuilt our lives together and eventually moved to the United States where we have continued to re-grow our family. Do you think your experience has played a part in making you who you are today? I know that on 2006 you went to visit Auschwitz – Birkenau. What were the first memories that come into your mind? Being torn apart from my brother and sister. I was traveling with my family in Poland and as we made our way to Auschwitz it suddenly seemed as if I was no longer a happy grandfather sightseeing with my family on a sunny summer day in 2006. Instead, I felt as if it had instantly become 1944, and I was a terrified 15-year-old prisoner in a concentration camp. Images, smells and sounds of the past bombarded me: brown uniforms . . . swastikas. . . sirens . . . Gestapo . . . SS . . . shiny black leather boots . . . murderous dogs . . . pistols . . . rifles . . . screams . . . shouts . . . whips . . . fire… smoke . . . ashes . . .my mother’s face . . . my little brother’s silent terror . . . selektions. . . mountains of skeletal corpses . . . children savagely torn from their mothers . . . furnaces . . . fire pits . . . frightened faces . . . starvation . . . gas chambers . . . barbwire . . . kapos . . . shovels . . . sledge hammers . . . standing for hours in freezing cold roll-calls . . . dying faces . . . bulging bloodshot eyes . . . typhus . . . death march . . . cattle cars . . . bunkers . . . attics . . . beatings . . . lice . . .vermin . . .latrines . . . my broken and dying cousin Isaac . . . death . . .more death . . . endless death. If you don’t know the meaning of any those aforementioned words, consider yourself lucky. Later that day, in Birkenau, as I gazed at the platform where the Nazis had chased us out of those cattle cars—ripping us apart forever from our loved ones—the waves of horror continued to erupt from the depths of my soul. After touring the camp we were further sickened by the marsh where the Nazis had forced Jewish inmates to dump tons of human ashes in the swampy waters. Now frogs live and thrive among the ashes of our dear departed ones. We also saw the fire pits where so many bodies—some still alive—were dumped and incinerated when the crematoriums could not “process” the bodies fast enough. Fighting nausea and dizziness, my angry question remained crystal clear: Where was the world? We finally completed this tour of hell, and tried to process the horror. And then we were utterly surprised and relieved to see that amidst all this anguish, there actually was one profoundly positive and healing moment. Almost as if they had been waiting for us, right in front of the new memorial there happened to be a brigade of Israeli soldiers, men and women in full dress uniform. They were conducting a memorial ceremony in Hebrew, which included reciting the Kaddish, and held an enormous flag of Israel. At the conclusion of the ceremony, they sang Israel’s National Anthem, “Hatikvah (Hope).” The uncontrollable tears that flowed down our faces provided a much–needed catharsis, or release of our emotions. What a profound and perfect ending to a sad, sad day and what a perfect ending to a very meaningful and memorable journey. You’re the founder of the ZACHOR Holocaust Remembrance Foundation and I truly believe that what you’re doing is very important. Your mission is to ensure that the memory and lessons of the Holocaust are never forgotten. Can you please tell us more about your Foundation? I created the Zachor Holocaust Remembrance Foundation to prevent the world from developing amnesia. We support educational opportunities and speaking events, including my own speaking engagements, around the world. We also produce and provide pins that are inscribed with the Hebrew word ‘Zachor’ which means ‘Remember.’ These serve as a physical token for those who learn about the Holocaust at our events to help ensure that they never forget the lessons of the Holocaust or the feeling they had when they met a survivor. As the number of Holocaust survivors becomes fewer and fewer it is our responsibility to make sure that others understand its lessons. The young people who hear us speak and read our stories are the last generation to have access to a survivor. They will be the last to witness the truth. They will have the responsibility of making sure our stories and the lessons they teach, will live on after we are gone. What about the pins? Can we request them also from abroad? Thank you very much for your precious answers and for that you’re doing. As you know thanks to UN PONTE per ANNE FRANK I want to keep talking about the Holocaust, its survivors and its victims. My aim is to promote peace and acceptance and combat any form of discrimination. I truly believe it’s very important to keep talking about the Holocaust and the World War II. This is a part of history which must never be forgotten, lest it should be repeated. Can you give a message for all the young people that are our future? Yes. Stop bullying. People in this world need to learn from the lessons of the Holocaust and learn to live with respect and in peace. Shout out for respect to make this a better world and it will remain as your personal pledge forever. Additionally, I want my book to serve as an inspiration for future generations. I don’t want you to feel sorry for me. I want you to be inspired by my experiences to live your best life. Individuals can’t always choose what happens to us. But whether it’s a crisis or a calamity, we can choose to either let it ruin our lives or to learn from it and move forward. It is essential to understand the consequences of personal choices. It is possible to let tragedy or trauma become the reason to stop living; but it is also possible to live through extreme circumstances and commit to a life that has meaning, a life that matters.